* Optionally, moisten the rims of two cocktail glasses with the edge of a lime half and dip the rims in the salt/sugar mixture. Fill glasses with ice and set aside. Spoon the cranberry sauce into the metal half of a Boston-style cocktail shaker . Squeeze the lime half and orange half into the shaker and muddle to combine with the cranberry sauce. Join shaker halves and shake briskly for 10-15 seconds. Strain over ice into cocktail glasses and serve. Bartender’s hints: Any canned cranberry sauce (either whole or jellied) works well with this recipe. My preference is to use our homemade sauce — it contains a bit of red pepper, plus orange juice and Grand Marnier, so it blends amazingly well with tequila. And because it’s made with whole cranberries, tiny bits of berry make their way through the strainer and accent the cranberry margarita nicely. Also: Experiment with the amount of agave nectar to suit your guests’ tastes. 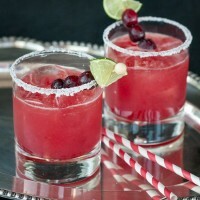 2 teaspoons will result in a sweeter cranberry margarita while 1 teaspoon will taste more tart.